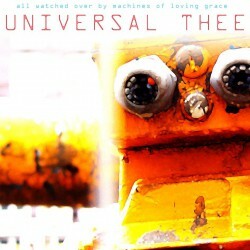 Power pop trio Universal Thee release their sophomore album All Watched Over By Machines of Loving Grace on 9th February. The album reflects a natural growth and progression in their sound from their debut Back To Earth. This time around Universal Thee sound more refined; contagious harmonies are married with memorable melodies. Certainly opener ‘Why’ and ‘Keep Falling’ get the album off to a storming start, raising a sound similar to the Pixies and Teenage Fanclub. It’s a sound that initially is easy to get on board with and enjoy without much of a challenge. Unfortunately All Watched Over By Machines of Loving Grace turns out to be a bit of mixed bag. If every track was as good as ‘Xang’ or ‘Hamlet 3’ then the band would be on to a sure fire winner. The former is the highlight of the album and shows the band at their most raucous and most infectious, while the later has an enchanting pop rock style reminiscent of Pinkerton era Weezer. The album peaks towards the end with the storming ‘Hounds’. There’s an urgency and swagger to the track that makes you instantly fall in love and produce a huge grin. That’s not to say the other tracks are bad, they just fall a bit short of the quality you expect. The potential is obvious in ‘Hey’ and ‘Sail Away’ yet both end up sound a little flat and perhaps a little like they’re trying too hard. Album closer ‘Light On’ goes close again, it has all the right ingredients to be one of the best tracks on the album – it’s as if they’ve left in the oven too long and over cooked it. For an album that on the surface is an easy listen, it turns out to be a bit of slog. The quality is undeniable and you want to like it, you’re just left having to give it too much attention with little reward. It’s one of those albums that could easily fade into the background without due care and attention. On the whole it’s not bad, just not that impressive.